Established in the early 1900s by foreign settlers, Londrina initially served as a stopover point for British coffee traders transporting beans from Paraná and São Paulo to the port of Santos. Start off your visit on the 1st (Fri): snap pictures at Parada do Coco, then contemplate the waterfront views at Igapo Lake, then admire the natural beauty at Jardim Botanico de Londrina, and finally look for gifts at Londrina Catuaí Mall. On the 2nd (Sat), you'll have a packed day of sightseeing: explore and take pictures at Parque de Exposicoes Governador Ney Braga, contemplate in the serene atmosphere at Santuario de Gracas Schoenstatt, then take in the spiritual surroundings of Catedral Metropolitana de Londrina, then get engrossed in the history at Museu Historico de Londrina Padre Carlos Weiss, and finally take in the waterfront at Calcadao de Londrina. To see traveler tips and tourist information, refer to the Londrina trip planner . 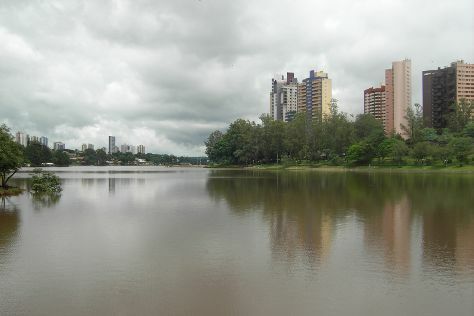 February in Londrina sees daily highs of 35°C and lows of 24°C at night. Finish your sightseeing early on the 2nd (Sat) so you can travel back home.